We are offering this beautiful and exceptional maintained Sailing Catamaran, LAGOON 400. 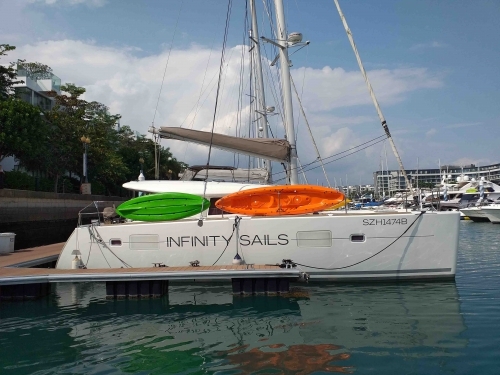 This yacht is used privately and with local charters within Singapore waters. The yacht has a permanent crew which is taking care with the best detailing materials - her look is superb, inside and outside. Both engines (Yanmar 40HP diesel) are shown with approx. 1300 engine hours and do receive the best service. She has just finished a large overhaul in September 2018 with a 6 layer antifouling coat, Sail drive overhaul, new coupling clutches, gear units overhaul, new under water lights (8 x Ocean LED in blue), new 60m Anchor chain, additional cabinets in both storage hatch.